Material is published in the form of electronic books (eBooks). eBooks enable the user to move the published material to a local destination such as a personal computer (PC) or personal digital assistant (PDA). The advantage is portability of the material; a connection to the Internet is not required. Another advantage is the capability for the PC to read the material to the user through text-to-speech technology. One format for distribution is the Microsoft Reader format. The published content is saved in Microsoft Reader compatible format and distributed. To use this format the user must obtain the Microsoft Reader software from Microsoft, and compatible content from a publisher. 8. Open the ebook and read the material. Microsoft Reader is a software application used in electronic books distributed in the Microsoft Reader format. Several versions of Reader exist. A version exists for personal computers (PCs) and Pocket PC personal digital assistants (PDAs). Microsoft Reader for PDAs enables users to transfer eBooks to the PDA and use Reader to view the content. Microsoft controls the distribution of the Reader. The Reader is generally free. Note activation of Reader is required to view some content. Activation tends to confuse users because a Microsoft Passport account is required. Follow the respective links for additional information and download instructions. Complete the Member Services Registration. A word about the Registration Check security feature…type the text depicted in the picture. This tends to be difficult; note and use the audible link if your computer audible system is working; it is much easier. To do this click the link “I can’t see this picture”; a new dialog opens; then click the link “Listen to the characters in an audio file”; type the characters in the input area. Use the mouse to select the continue button and proceed with the registration. Two methods exist for activation of Microsoft Reader. One method is activation at the time of setup (good if you possess a Microsoft .Net Passport account); and the second method is activation after installation of Microsoft Reader. Activation during the time of setup is accomplished through using the setup dialog as you progress through the installation. The destination of the link may be a little confusing because it is an update message. Use the mouse to select the “Yes” link to check if your software is up to date. A wait and system checking message displays. The next message is either your software is up to date or it is not up to date. It should be up to date because it was just downloaded. Use the “Click here” to begin activation link. Use the “Sign in to Start the Activation Process” link (this is where a Passport account is needed). Sign in and proceed with activation. Text-to-Speech is a technology to covert printed text into an audible format for listening on speakers or headphones. The audible message is not a recording of someone reading the text but a real-time conversion of the text into audible format. The quality and volume of the audible format is dependent on the computer hardware and software used. You might want to experiment with listening on headphones is the volume or quality of your computer speakers is not to your liking. External powered speakers often provide the added advantage of separate volume controls; volume controls located on the speakers. Control text-to-speech in Microsoft Reader via the component box located at the bottom of the page (depicted in the following image). Notice the similarity of the control to those found on tape players. The top control is a volume control with a sliding button; click and drag the button to slide the button to increase or decrease volume. The next line includes controls for: play; stop; previous section; back; page number; forward; next section; skip back or ahead; and annotate. Place the mouse curser over the control to display a tool tip. Use the mouse to left click the control as desired. The next line indicates the page numbers of eBook. The close button for the control is located in the upper right corner and is depicted as a box with an X in it (closing does not stop the voice from playing). To change the voice speed use the properties located in another location, the speech properties dialog. To get to the speech properties dialog use the mouse to select Start, click Control Panel, select Sounds Speech Audio Devices, select Speech, and then select the Text-to-Speech tab (depicted in the next image). Two versions of Dr. MacLeod’s ebooks exist. 2. FaithJLM.lit is a reduced work generated from the web site and new material BUT lacking the full text of the four published works: A Season of Grace; Going Beyond Literalism; A Field of Honour; and The Great Doctor Waddel. 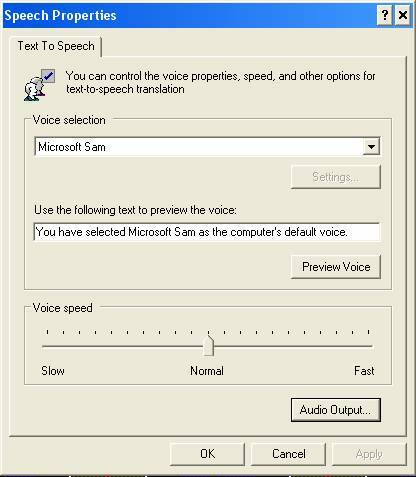 After installing and activating Microsoft Reader and the optional Microsoft Text-to-Speech Package, click either of the links above to download the whole book to your computer.